A rocket called Xoie, built by Masten Space Systems of Mojave, Calif., flies between two launch pads on Oct. 30, 2009 to win the top $1 million prize of the Northrop Grumman Lunar Lander Challenge sponsored by NASA. Two California companies, one a rocket engine builder andthe other a mock moon lander champion, have teamed up to develop new privateunmanned vehicles that NASA could send to the moon, Mars and asteroids. The companies are XCOR Aerospace, specializing in rocket engines,and Masten Space Systems — which won a $1 million NASA contest to build and flyrobotic vehicles on simulated hops onthe moon. The two companies hope to combine their areas of expertise inanticipation of NASA-sponsored unmanned lander projects, according a jointannouncement this week. 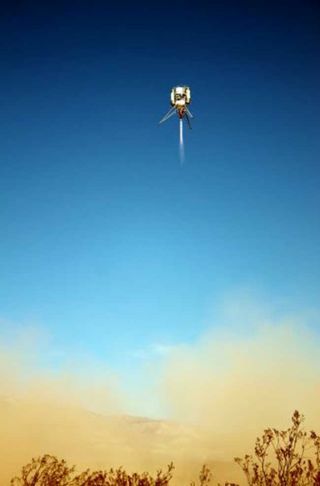 "It seems like NASA may actually be interested in acommercial approach to landers," Michael Mealling,of Masten Space Systems, told SPACE.com Tuesday. Under NASA's new space plan proposedby President Barack Obama, commercial spacecraft and services have a largerrole than before. That new plan, if approved byCongress, would cancel NASA's earlier Constellation program in charge of newmoon landers and other vehicles. The space agency'sshuttle fleet is retiring later this year after two final missions. Mealling said NASA may not be theonly potential customer for the team's unmanned landing craft and technology.The swarm of private teams and groups competing in the $30 million Google LunarX Prize to send robot probes to the moon, move them around and beam back livevideo is another possibility, he said. "There are Google Lunar Lander X Prize teams out therethat might end up wanting some of this stuff too," Mealling said. ?XCOR and Masten happen to be"next door neighbors" in California's Mojave Desert, said DaveMasten, founder and President of Masten Space Systems. "We?ve worked together on many tactical problems overthe years and our corporate cultures mesh well," Masten said in astatement. "Working together on something like this simply made too muchsense." XCOR Aerospace has created liquid oxygen (LOX)/Methanepowered propulsion systems for NASA, and built similar engines for the publicdebut of the RocketRacing League, which showcases NASCAR-style competitions in the sky. But the Rocket Racing League later switched to engines madeby Armadillo Aerospace for unknown reasons. XCOR disputed that its engines hadany problems. Masten Space Systems claimed a first prize for Level 2 of theNorthrop Grumman Lunar Lander Challenge in October 2009. The company's Xoievehicle beat long-time front-runner Armadillo Aerospace, a Texas-based team ledby video game developer John Carmack. Both Masten and XCOR have proposed development of their ownindividual suborbitalrocketships in the past, such as XCOR's Lynx concept.But now they look to jointly market their complementary skill sets and servicesto NASA as prime contractors, according to the joint statement. "It?s a no brainer, Dave?s team is the absolute bestNew Space company when it comes to VTVL and autopilot unmanned operations —they demonstrated that in October by winning NASA?s lander challenge,"said Andrew Nelson, chief operating officer of XCOR Aerospace, in a statement. "And we feel our LOX/methane engines are unsurpassed in the trade spacetoday by anyone." "We should bring this tandem set of best in classcapabilities to NASA, it just makes sense for them and for us,? Nelsonconcluded.